At Computex, SilverStone started to show off its early mini-STX prototype cases. This week it introduced its first commercial product, the VT01. The new PC case inherits classic design elements of SilverStone chassis and despite the fact that Mini-STX is mainly intended for system integrators, SilverStone plans to sell its VT01 in retail as well. Mini-STX is the latest iteration of form factor for motherboards, decreasing from the 17cm x 17cm of the mini-ITX into a 12.7cm square by ditching the full-length PCIe port as well as moving the power into an external brick for a DC-input. At Computex, especially at vendors such as Silverstone and ECS (who works closely with Intel for the NUC), Mini-STX was being pushed as the platform to have in certain commercial verticals, such as digital signage, where power and adjustability are important. It aims to fit above the Core-M mini-PCs in that regard. While the interest for small form-factor PCs is increasing mainly because such systems are small, energy-efficient, and provide good enough level of performance, there is another reason for their growing popularity. Highly-integrated systems are usually pretty inexpensive and have additional flexibility to adjust the socketable CPU in the Mini-STX form-factor. Style, affordability and a certain degree of flexibility is what SilverStone hopes the VT01 is all about. 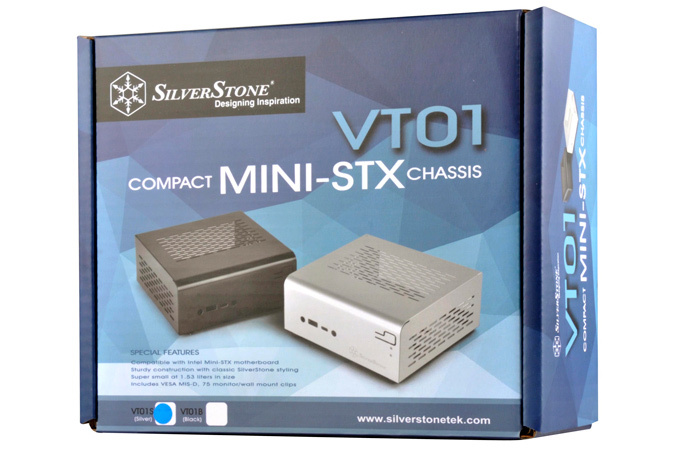 SilverStone’s VT01 chassis is made of 0.8 mm stainless steel and a weight just 582 grams. 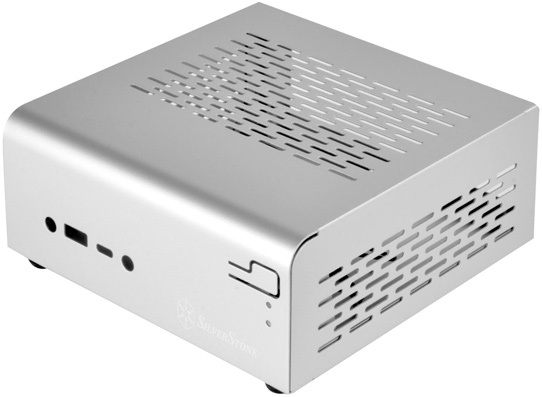 The case can fit in one Mini-STX motherboard with a cooler that is no higher than 34 mm as well as one 2.5” SSD or HDD. Theoretically, high-performance 34-mm coolers (such as Scythe Kodati) can support CPUs with up to 65 W TDP, hence, VT01-based Mini-STX systems can be quite powerful when paired with the appropriate hardware. The VT01 has one USB Type-A as well as one USB Type-C ports in addition to an audio in and audio out. Besides, the case has VESA mount mechanism. Initially SilverStone plans to offer the silver version of the case, but shortly it also plans to debut the black one. We also saw a blue one at Computex, which may come later. Since the case is very small, it naturally does not cost a lot: the manufacturer intends to charge $35 for it in the U.S., once it is available in approximately three weeks from now. In Europe, the case will be available late in September. Interested in how this will stack up to in win's new chompin case. Any chance of a review?